Earlier in the year my husband and I had to leave our rented flat of five years, but every cloud has a silver lining and for us that meant buying our own home. I was so excited for us to finally have a place of our own, and really being able to put our own stamp on it. Our previous flat was furnished which meant we were starting from scratch, which was exciting and intimidating in equal measure. I was incredibly lucky to work with West Elm on designing this room. I have been teaching at West Elm and have been admiring their beautiful furniture for years, so it was so exciting to finally have some of their beautiful pieces in my home. Moving from a rented new build flat into a large converted Victorian flat meant decorating options for this room seemed endless. Fortunately I had Sophia from the West Elm design team to help me plan the space and select pieces that would work with the few things we already owned (a free service West Elm provide). I showed Sophia the floor plan, a few inspiration images and talked about my personal style (obviously my husband lives here too but he let me have free reign with this room). 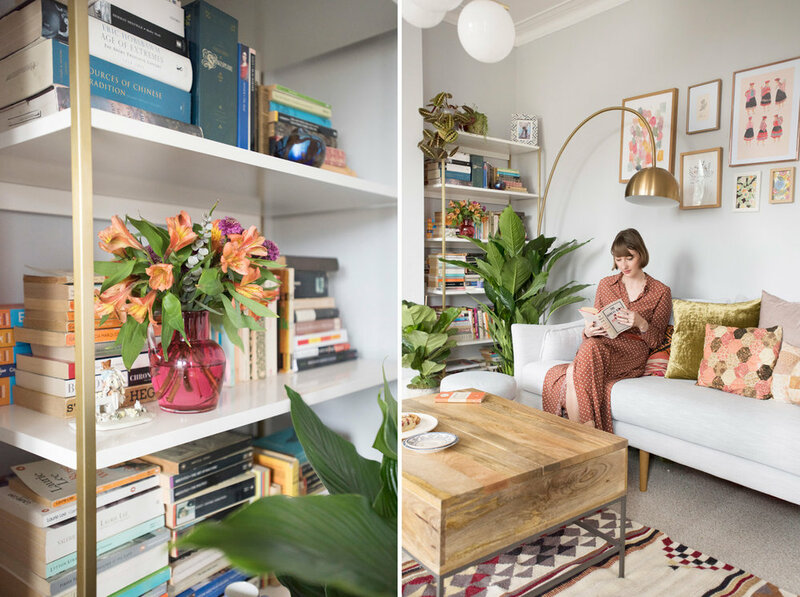 We went for a slightly mid century modern look with lots of plants, sophisticated gold and brass accents and warm tones. 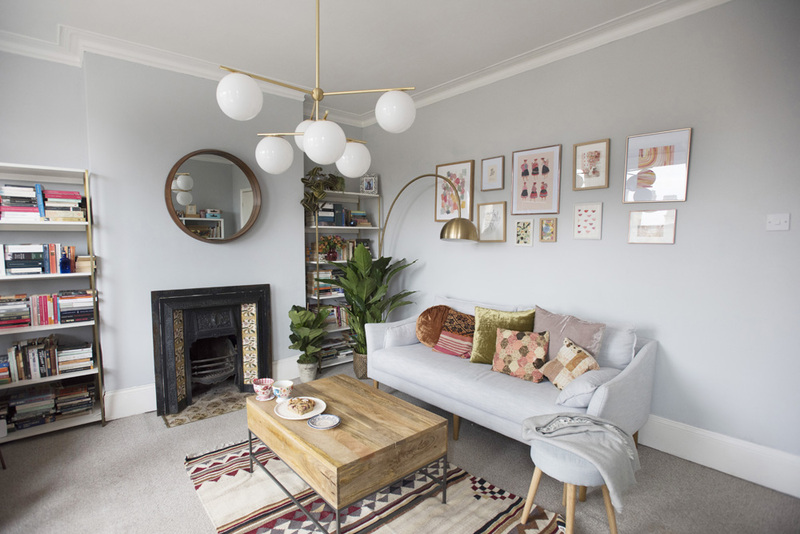 I was initially worried that painting the walls the same shade of light grey as the sofa would be a bit of a mistake, but I think the accessories and soft furnishings really bring it together. West Elm classes this sofa as a loveseat, but it easily seats three people and is incredibly comfy. I’m all about finding as much hidden storage as possible, which is why this coffee table is so perfect. Inside it is full of photo albums and boardgames. My husband and I are total bibliophiles so bookshelves were an absolute must. These shelves fit in so perfectly and hold a huge amount of books. My husband actually unpacked and styled the books, and I love the way he arranged them. I love the juxtaposition of my books next to his, copies of Jane Austen and Little Women, next to books about anarchy and moral philosophy. I like to think these bookshelves give you a bit of an insight into who we are as people. My husband and I don’t own a TV, which means we didn’t have to worry about pointing our furniture towards one corner of the room, and instead we can sit on the sofa and enjoy the lovely view of Victorian Almshouses through the bay window. When I’ve tried to do a gallery wall in the past I’ve made the mistake of going too small and it has lacked impact, so I tried to be a little bit bolder with this one. The beautiful rose gold frames are from West Elm and the rest of the frames are either vintage or ones we already had from IKEA. I wanted the artwork on this wall to feel warm and peaceful, and I created a few abstract watercolour pieces especially to create this mood. I also ordered an A3 version of my Peruvian ladies print, and framed a piece of the original artwork from my book inspired by a trip to Morocco. I love how little reminders of our holidays together are scattered throughout the flat. The velvet cushions are from West Elm and the others are either from Peru or vintage patchwork, adding a bit of character to the sofa. This room had a working fireplace but no fire surround. I sourced a Victorian tiled fire surround on Facebook marketplace for just £30. I absolutely love the tiles and I think it works so well within the room. As the fireplace is very decorative I kept it simple with this beautiful mirror above which nicely highlights the statement lighting. I absolutely love how they look in the room and they give out a gorgeous warm light. We placed them over the coffee table so no one walks into them and bangs their head, although my husband has hit his head on them at least once. I love this cosy little corner. This chair is an antique piece that has been passed through the family; you can read about how I painted it green in this blog post. The combination of the pink velvet curtains, the green chair and the copper sidetable just makes me so happy. 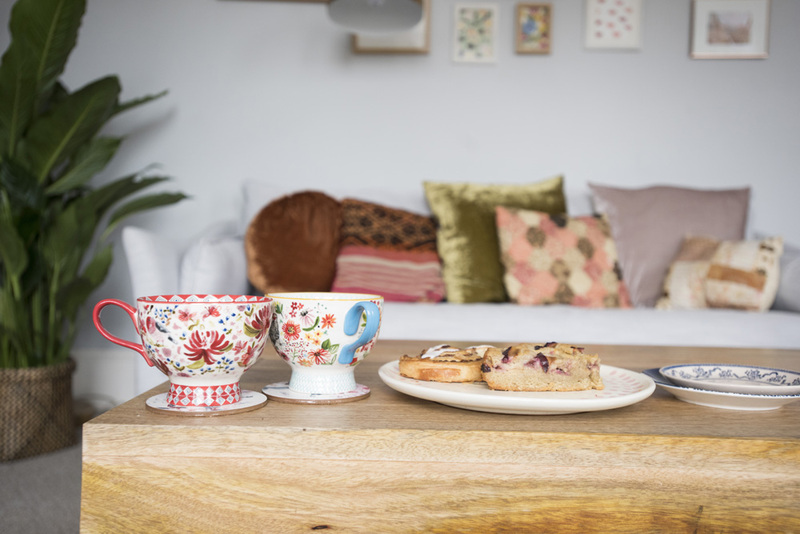 It’s the perfect place to sit with a cup of tea and ring my granny, as she’s the only person who ever rings my landline. The pink curtains are from DKNY, via TK Maxx and the cushion is from Peru. This post is sponsored by West Elm, who kindly gifted me the furniture pictured in the post. The photos were taken by my very talented friend Tia Talula. The flowers and several of the plants were provided by my good friend Migle, owner of Your London Florist.